ASTM B466 / B467, UNS C70600, DIN 2.0872. 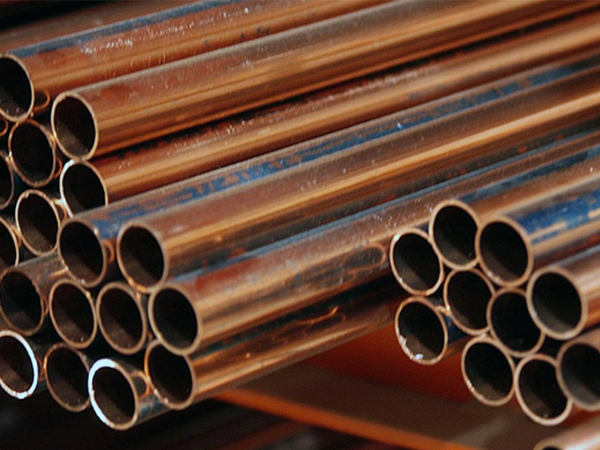 ASME SB466 Copper Nickel Seamless Pipes Supplier in Mumbai, India, CuNi C70600 Pipes, Copper Nickel DIN 2.0872 Pipes, ASTM B466 Cupro Nickel 90/10 Pipes, Cu-Ni 90-10 Tubing, Cupro Nickel UNS C70600 Welded Pipes, WERKSTOFF NR. 2.0872 Tubing, CuNi 90 / 10 UNS C70600 Pipe. Cupro Nickel 90/10 Welding Pipes, 90/10 Copper Nickel Pipes, 90/10 Cu-Ni Tubing , Cu-Ni 90-10 Pipes, Copper Nickel 90/10 Pipe, 90-10 Pipe Price, Cupro Nickel 90/10 Tubes, Cu-Ni 90/10 Pipes, Cupro Nickel 90/10 Electric Resistance Welded Tubing, 90/10 Copper Nickel Tubing, Copper Nickel 90/10 Tubes, 90/10 Cu-Ni Pipe, Cupro Nickel 90/10 Tubing Exporter, ASTM B466 CuNi 90/10 Welding Pipe. Jayesh metal is one of the well-known producers and fabricators in encouraging the use of Cu 90/10 Pipes and promoting the right and efficient applications. The item is produced by using the superior quality alloy that is being sourced from the good merchants. Also, the item is produced by making use of latest tools and technology that has resulted in the high quality of pipes production. The product possesses various features that have resulted in high demand and appreciable all across the globe. The features are the high tensile strength, stability, rugged construction, flexibility, durability, commendable dimensional accuracy, corrosion resistance, pitting resistance etc. The dimension of Cu 90/10 Pipes is ASME, API and ASTM etc. It is specializing in larger sized diameter. The type of pipes provided is seamless, fabricated, welded and ERW. The form in which it is available is round, hydraulic etc. In length it is offered is in single random and double random and in cut length. The end in which it is available is the beveled end, plain end and treaded. The size, wall thickness, length, width etc is varying differently as per the demand of the buyer. The item is undergoing various testing successfully as to assure high quality of pipes production. The testing is PMI test, IGC test, hardness test, flattening test, flaring test, macro test, micro test, chemical test, mechanical test etc. The item when supplied is packed using wooden boxes, wooden crates, carton boxes etc to assure the high level of safety and precautions from severe damages. cupro nickel 90/10 tubing 3/8, copper nickel 90-10 pipe prices. 90/10 cu-ni tubing, copper nickel pipe weight chart, schedule 40 cuni 90-10 pipe dimensions, jindal cupro nickel 90/10 pipes price list, cu-ni 90/10 seamless pipe suppliers in mumbai, 90-10 copper nickel pipe price list, cupro nickel 90/10 pipes supplier in india, 90/10 cuni pipes dealer in mumbai, cu nickel 90/10 pipe schedule chart, copper nickel 90/10 pipe prices, cupro nickel 90-10 tubing sizes, cuni 90/10 pipe grades chart, copper nickel 90/10 pipe price per foot, cupro nickel 90/10 weight chart pdf, 90/10 cuni pipe specifications, cu-ni 90/10 pipe manufacturers in mumbai, cupro nickel 90/10 rectangular tubing, 90/10 cupro nickel pipe schedule 10, 90-10 copper nickel pipe schedule 80, 90 / 10 cu-ni pipe, schedule 160 cu-ni 90 / 10 pipe, schedule 40 cupro nickel 90/10 pipe, 90-10 copper nickel pipe dimensions, copper nickel 90/10 pipe supplier in mumbai, cu-ni 90 - 10 tubes exporter in india, copper nickel 90/10 pipe manufacturer in mumbai, cupro nickel 90 / 10 pipe specifications astm, jindal cuni 90/10 pipe price list, 3" copper nickel 90-10 pipe, cu-ni 90/10 pipe manufacturers in india, copper nickel 90-10 pipe price list, schedule 40 90/10 copper nickel pipe pressure rating, cupro nickel 90/10 pipe price list. Chile, Netherlands, Finland, United Arab Emirates, South Korea, Gambia, Saudi Arabia, Vietnam, Norway, Sweden, Morocco, Bahrain, Australia, Estonia, Macau, Nigeria, Ecuador, Peru, Puerto Rico, Poland, Mongolia, Canada, Bulgaria, Kuwait, Belgium, Germany, Bangladesh, Sri Lanka, Italy, Greece, Trinidad & Tobago,Tunisia, Zimbabwe, Indonesia, Costa Rica , , Turkey, Croatia, Hungary, Nepal, Denmark, Kazakhstan, Jordan, Czech Republic, Gabon, Qatar, Chile, Egypt, Azerbaijan, Yemen, Ireland, France, Algeria, Belarus, Hong Kong, Argentina, Japan, Lebanon, Thailand, Philippines, Serbia, New Zealand, Ghana, Russia, Mexico, Romania, Nigeria, Namibia, Colombia, Pakistan, Venezuela, Libya, Israel, Portugal, Iran, China, Tibet, United States, Bhutan, South Africa, Iran, India, Slovakia, United Kingdom, Kenya, Switzerland, Ukraine, Singapore, Brazil, Lithuania, Afghanistan, Oman , Austria, Bolivia, Poland, Spain, Iraq, Malaysia, Angola, Taiwan. New Delhi, Port-of-Spain, Surat, Ahvaz, Nagpur, Ludhiana, Caracas, Bhopal, Moscow, Madrid, Ulsan, Doha, Edmonton, Petaling Jaya, Courbevoie, Sydney, Jamshedpur, Rio de Janeiro, Pune , Vadodara, Chennai, Ho Chi Minh City, Cairo, Bangkok, Santiago, Vung Tau, Ankara, Algiers, Pimpri-Chinchwad, Rajkot, Mexico City, Montreal, Howrah, Melbourne, La Victoria, Muscat, Ernakulam, Granada, Dubai, Manama, Perth, Riyadh, Hanoi, Jeddah, Aberdeen, Toronto, Hyderabad, Jaipur, Karachi, Colombo, Thane, Abu Dhabi, Seoul, Brisbane, New York, Gurgaon, Mumbai, Bogota, Visakhapatnam, Kolkata, Geoje-si, Baroda, Kuwait City, Houston, Dallas, Ahmedabad, Lahore, Tehran, Chandigarh, Istanbul, Thiruvananthapuram, Nashik, London, Lagos, Ranchi, Kuala Lumpur, Hong Kong, Indore, Secunderabad, Busan, Faridabad, Bengaluru, Los Angeles, Chiyoda, Milan, Haryana, Noida, Singapore, Al Khobar, Navi Mumbai, Coimbatore, Jakarta, Calgary, Gimhae-si, Sharjah, Dammam, Kanpur, Al Jubail, Atyrau.